Published on January 19, 2012 February 27, 2012 by cara.b.b. i really do love reading, but my gusto for it is a bit cyclical. right now, i’m on a little kick and my list is long, so i hope to keep up the momentum and keep the nightly tradition of reading a permanent one. It’s a nice transition from a busy day into dream land. i’m usually into reading what i call mind candy – basically a fun little novel – but i’ve added a few ‘real’ books to the queue that i’ve heard some good things about. here’s what’s on my nightstand. 1. i just finished up the girl with the dragon tattoo last night. i thought it was really good, but it does have some pretty intense parts and ‘adult’ subject matter, if. ya. know. what. i. mean. there are two more books that follow it, and once jared is done with them, they’ll move from his nightstand to mine. 2. next up for me is in defense of food, which i’m pretty excited to read. i think the experience of having been pregnant and then wanting to start beckett off on the right foot nutritionally has made me so much more conscious of what goes into our bodies. if i’m making sure he has a good serving of veg at lunch and dinner, why am i not doing the same for myself? and other questions like that. 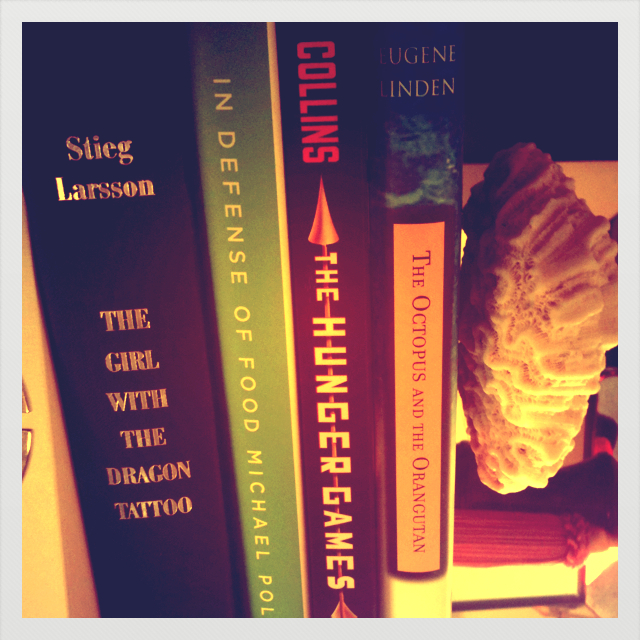 3. the hunger games – i just have to see what all the fuss is about, and i’ll read all three eventually. 4. the octopus and the orangutan: more true tales of animal intrigue, intelligence, and ingenuity – my dad was telling some stories from this book and it really peaked my interest. i’m always adding to my list, so if you have a recommendation pass it along! All three of the Larsson series are pretty intense, but good–I hear the American movie does a good job too, so hope to see it soon. I’ve read all three of the Hunger Games (not sure how, but this one is being made into movie as well)–and think you’ll find them fast reads and thought-provoking. I’ll pass along to you some that my book club does–now that college is over, you can do all the pleasure reading you want–plus it’s great modeling for the little guy! would love some of your book club reads, aunt debbie!! i would venture to say you will read the hunger games a lot faster than eventually! it’s an addicting series! can’t wait to see what you think about in defense of food. i’ve been waffling on that one for awhile now. thanks shanna! you’re right about in defense…it’s a slow start, but pretty darn interesting.